Airy and light in sterling silver featuring cutouts that add to their style. 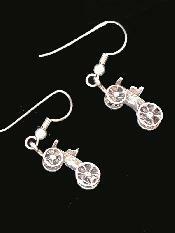 Sterling silver three dimensional little piggy earrings. Stop and smell the roses; but be careful where you step because there are buffalos about. Sterling silver sand cast western inspired earrings for her. 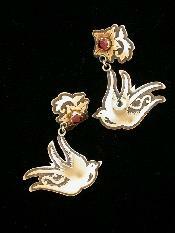 Peace doves. Hanging 14K gold earrings with a beautiful garnet. Truly a striking pair. For her. 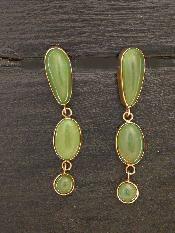 Oriental wonders in the form of jade. 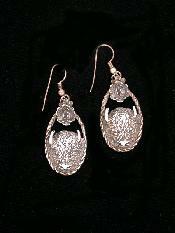 Mounted into 14K gold with a tear drop style and shape. For her. 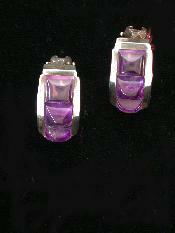 Richly colored amethyst stones; six of them. 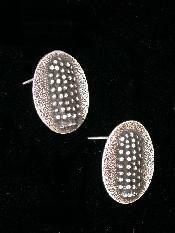 These stones were mounted into sterling silver which adds a nice contrast; don't you think. For her. Sterling silver wagons? You bet ya! The wagon train never looked so good. Light weight and fun, for her. 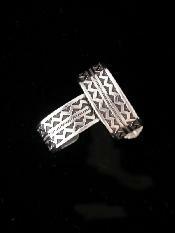 Expertly hand etched sterling silver hoops. Both have nicely hued turquoise stones as accents. For her. Precisely sand cast sterling silver hoop style earrings. 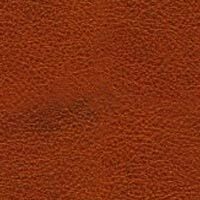 The pattern is slighly western in design. 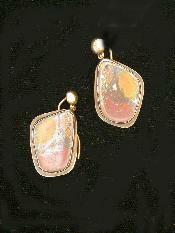 A pair of multi colored opal stone sgrace this exquisite pair of 14K gold earrings. For her. Corn being a staple food for many Native American tribes, why not sterling silver sand cast earrings in the form of corn on the cobb. 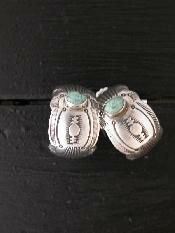 Sterling silver earringsin the form of western chaps. Notice the fine detail on the pair. For her. 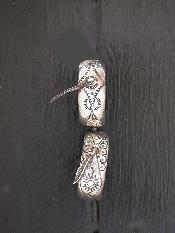 With two destinct designs patterns these sterling silver earings are unique. Then for added interest one can see dangling feathers on the pair as well. For her. 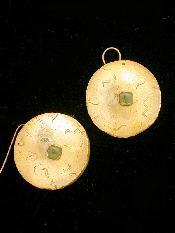 14K gold sand cast earrings with a jade piece a the center. For her. 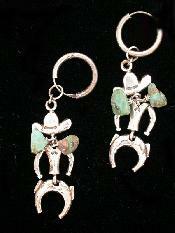 Sterling silver and turquoise dancing cowboys. These two buckaroos are wonderfully articulated so they move and are at the ready should a gun fight occur.